Guys, I can’t believe I’ve already spent six months blogging! It definitely doesn’t feel like it’s been that long. Over the last six months I have grown so much as a blogger, and I have learned so much in the process! Whether you’re a mom blogger like me, or you blog in another niche, I truly think you have to be willing to constantly learn in order to become success and make money blogging. That’s why I’m so excited to share with you some tips I learned this month, as well as what I made from this blog this month. Let’s talk about a few things you need to know in order to make money blogging. 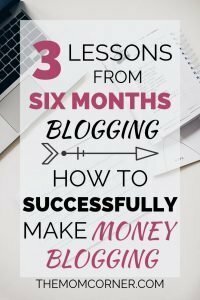 First off, if you want to make money blogging but don’t have a blog yet, you need to do that now! I can’t even begin to tell you how much I wish I had started sooner, or how fulfilling it has been since I did. If you’re skeptical about being able to make money from blogging–especially from a mom blog–don’t be. Seven months ago I was right where you are. 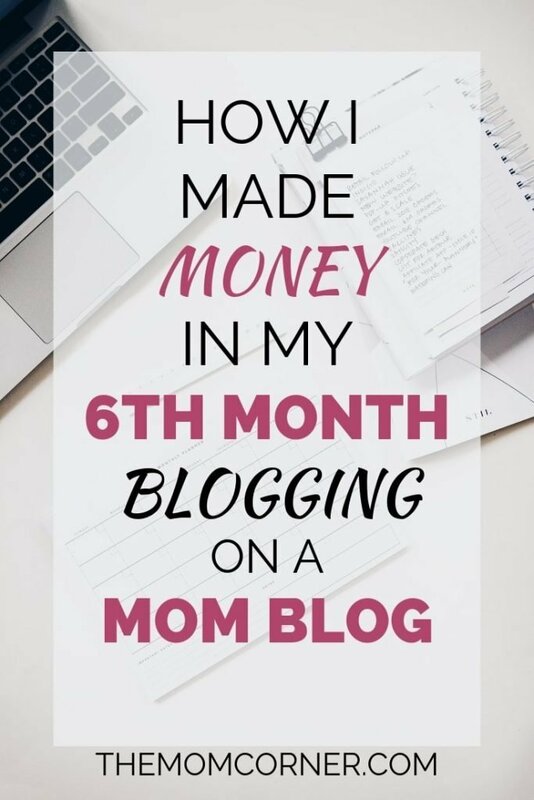 For the longest time I wasn’t really buying that you could make money just from blogging at home as a stay-at-home mom. Six months ago I finally decided to give it a try. And I can tell you right now, from experience, that you most definitely can make money as a stay-at-home mom with a mom blog (or any other blog!). To get started, you’ll need a self hosted WordPress blog. I 100% recommend hosting with Siteground–especially if you are tight on money to get started. They have been nothing but fast, safe, and reliable these past six months, and I plan to stick with them for the long haul! You can get started with them for as low as $3.95 a month, regardless of whether you choose a one, two, or three year plan. Most other hosting services require you to sign up and pay for three years in order to get the cheapest price–not the case with Siteground. And you will get tremendous service! If you already have a blog but would like to switch over to Siteground, you can migrate your wordpress blog for free! Now, on to three things I learned during my six months blogging! At the beginning of this month, I’ll admit I got a little lax in keeping up with my Pinterest account for this blog. Maybe it was laziness, maybe it was discouragement, maybe it was an after Christmas slump. Whatever it was, it set me back. I scheduled a few pins on Tailwind, but I didn’t fill up my pin schedule like I should have. What happened was my monthly viewers and my engagement rates steadily dropped. When I finally kicked myself back into gear and began regularly pinning again, those numbers steadily climbed back up. The point is, consistency is key in blogging. You have to consistently show up. Consistently post new content. Consistently pin. You have to consistently invest in your blog if you want it to succeed. A lot of blogs fail by six months. Why? Because they didn’t stay persistent when it got hard. When you first start out blogging, everything is an uphill climb. I’m not going to tell you that blogging is easy, because it’s not. But I do believe that it is worth it. The first few months of blogging can be tough. It’s hard to get people to notice you when you’re starting from scratch. It’s hard to find people who are interested in your writing. Discouragement is a real thing in the first few months of a new blog’s life. And for a lot of blogs, it spells the end for them. If you’re still in your first few months blogging, don’t give up. If you’ve been blogging for a while but are in a rough patch, don’t give up. Persistence is key to becoming a successful blogger–regardless of whether that means making money or just contributing to the blogging world because you love it (or both!). Don’t give up. Keep going. This is one I’m still working on, to be honest. But as I learn more and more, the more I see how important it is to put yourself out there as a blogger. It’s scary at times, I know. You never know whether someone will like what you write, or totally hate it. But the truth is most people will like it, if you open yourself up. Be willing to open up and show yourself. Alright, now that we’ve covered a few of the things I’ve learned from six months blogging, let’s talk about this month’s income report. To be honest with you, I really thought this month was going to be a total bust in the traffic and money department. I honestly thought that after the holiday rush and excitement, my traffic would take a hit and I probably wouldn’t make any money. I went into this month without a set, written down goal of what I wanted my traffic to look like. But in the back of my mind, I had a secret hope that maybe it would get to 2.5K visitors this month. It was only a few hundred more than I had last month. It would be growth, but not an unreasonable amount considering I expected to have a harder time getting traffic this month. Instead of having a lousy month, I had an awesome month! Instead of 2.5K visitors, I ended up with over 3.5K visitors! I hadn’t expected to have that much traffic for at least another two months! I also make some money from Adsense due to the increase in my traffic. Let’s look at the numbers. As I figured would happen, I didn’t make much from affiliates after Christmas. But, I definitely hadn’t figured on my ad revenue jumping up as much as it did. This just goes to show you that you shouldn’t underestimate what you can do! If you’re feeling discouraged, or don’t believe that you can make money blogging, be assured that you can. It is possible to make money from a mom blog (or any niche). And you can do it! You just have to be persistent enough to stick with it even when it feels like you’re not getting anywhere. What a great post! We probably both started blogging around the same time. My 6th month blog birthday was January 1st. I also did the same thing and kind of slacked off the first couple of weeks of January. I keep having those high and low moments with blogging but your right, consistency is key. Thanks for a little inspiration! My 6th month anniversary was the 1st too! That’s so cool! Same for me with the highs and lows. I’m starting to think maybe that’s just how it is over the course of a month, and maybe it’s okay if some days are better than others. So glad I could inspire you to keep at it! And thank you! I am rather fond of the theme myself. 🙂 Good luck with your blog!